is a shallow bay with 42 islands and provides breathtaking – fairy tale like – scenery. When 1974 James Bond "met The Man With the Golden Gun" on Ko Tapu, the limestone formations became famous worldwide. Some of them rise up as high as 350 meters. You can either visit Phang Nga Bay on a private daytrip with a speedboat or a Power Catamaran. We love sailing overnight charters in those calm waters with its fantastic scenery, but try to stay away from James Bond Island, since unfortunately it is overrun by tourists. There are much more similar islands in Phang Nga Bay with much less "traffic". It is great place to explore with kayaks. There are many caves to explore. 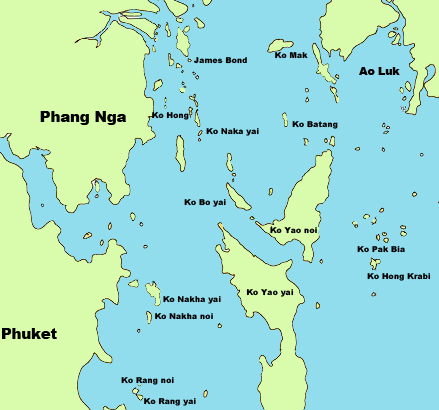 On some islands you will find hongs (Thai language for room). A Hong is a large space inside, such an island with a chimney - like opening to the sky. The area is teaming with wildlife. You have chances to see large lizards and monkeys and a large variety of birdlife. Since it is a National Park, you will find many uninhabited island for a peaceful anchorage at night.